Commercial buildings, varying from large corporate offices and associated car park entrances to industrial workshops or large-scale housing developments, require focus on predicting violent attack on the property’s vulnerabilities. Risk management and security consultants will attest to the greater success of thwarted attacks when physical security measures are integrated through-out the property. There is emphasis on the need for protective measures to be incorporated early in the project’s conception rather than reactive following fateful attack. An assessment of the unique vulnerabilities a commercial application may be at risk from is an absolute must. For industrial units and housing developments (city apartments for example), public entrances will require high-performance products due to the high-volume usage and ventilation needs, whilst still complying with security requirements as specified by the Architectural Liaison Officer (ALO) and legal building regulations. Charter Global are a leading manufacturer of high-performance specified products, working closely with industry professionals to provide physical security solutions adaptable to all applications. Continually dedicating resources to the research and development of loss prevention products, Charter Global are thrilled to provide physical measures up to SR5 standard. Accredited by the national crime prevention police initiative Secured By Design (SBD) standards of attack resistance, products are awarded a performance rating following scrupulous testing by the Loss Prevention Certification Board (LPCB). The possibility of a terrorist attack is terrifyingly high. The numerous threats commercial corporations receive are designed to spawn fear as much as they are intended to interfere with critical data, communications systems and cause mass casualties. Whilst many are thankfully thwarted before serious (or public) incident or found to be hoaxes, physical security provides commercial property with a contingency measures and fail-safes that would not otherwise be equipped for. Contingencies for violent crime and other major incidents (i.e. environmental damage, sabotage) should be covered by the business continuity management plan. An important document for commercial businesses of all sizes, a business continuity plan provides a practical guide for all employees and stakeholders of what action need to be taken, and the implications the business should expect following an incident. Being unprepared for an incident will undoubtedly have a very adverse effect on a business’ reputation with staff (staff will be unwilling to work in building that can’t protect them) and reputation with investors (investors and suppliers won’t want to be associated with a company that can’t manage itself). Shockingly, following the Manchester bombing in 2016, more than 40% of businesses affected ceased trading as a direct result of the horrific incident. It is the building operators and owners’ responsibility to protect commercial property from the type of attack it may be at risk from. Police.uk provide a brilliant resource for comparing crime statistics. Crime can be analysised by location and property type, highlighting if there have been a significant number of Power Tool attacks to industrial warehouses within a three-mile radius of over the past eighteen months for example, providing a basis for how to approach protecting your premises. Integr8 is Charter Global’s specialist manufacturer of performance standard security roller shutters. Recognising a increased demand for specification installations within commercial applications, Integr8 focuses solely on development of high-performance security shutters within commercial and community projects (further information is available on our dedicated Education, Healthcare and Community sector pages). I have a commercial office space in a traditional Victorian building (not listed). How can I secure it without taking away from the unique features? Integr8 Shutters are built-in, removing the need for a traditional bolt-on on head-box. Where space can be limited and any original, traditional or unique features under threat of removal or relocation, security shutters that integrate directly with the architectural lintel of the structural frame and therefore requiring less headroom aperture for engineers to access the building’s structure, the alterations to original building features will be limited. For heritage and listed applications, please visit our dedicated Heritage page. My commercial project requires as SR3 rated security measure to protect against targeted crowbar attacks. Is there such a shutter? ­­­The LPCB LPS 1175 security standard categorise crowbars, scissor jacks and several other medium-threat tools within Security Rating 3. SR3 standard products are attacked in a test setting for twenty-minute period, with four tools each allowed five minutes against the security shutter. Integr8 can provides a range of lath profiles at SR3 standard including perforated with 13% visibility. I need to secure a commercial space on a busy London street. How do I protect the stock, staff and assets without drawing too much attention to the building? It is common practice for commercial buildings to contract independent security consultants, or to have a Risk Manager on staff, for the continuous improvement of their security procedures in busy and high-risk cities. 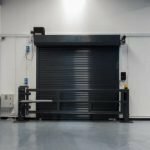 All Integr8 shutters are incorporated with unique LockDown technology that means no auxiliary locking is required to the shutter guides.